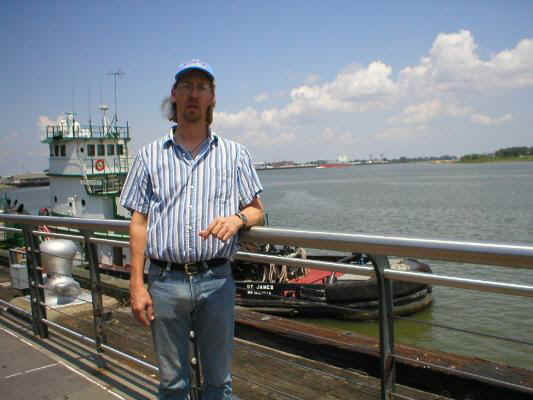 This is a picture of me along the riverfront in New Orleans. I'm standing in front of the tugboat "St. James." I've been called a lot of things, but I've never been called a "Saint." I was brought into this world on November 26th, 1966 (for you non-mathematicians out there, that would make me 37). My father is James E. Lorimor, and my mother is Nelda Laskey. As you can probably tell, my parents have divorced and have remarried. My step-mother is Deborah Lorimor, and my step-father is Charles "Chuck" Laskey. I have two sisters, 3 step-brothers, and one step-sister. I have more nieces and nephews than I have fingers and toes. Come to think of it.....I'm the only child that isn't "in production" yet. I hope my biological clock hasn't started ticking yet. I have a wide variety of interests. As you can probably tell from this web site, I thoroughly enjoy computers. I spend most of my free time "playing" on the computer. I have delusions of grandeur and consider myself a "programmer." I've been using Visual Basic for almost 10 years, and I'm STILL learning it. I don't think I'll ever have the whole language mastered. I currently have 4 computers. The first computer is a 2.4G P4 Dell. Another is a 450 Mhz Dell that I bought used from the feedlot and installed Linux on in the hopes of getting a job at our local ISP as a System Administrator. They have since moved all internet related jobs to Colby, which leaves me at my current job. I also have two computers that I recently built, 2.8G P4's. The 2.4 Dell and the two 2.8's have Windows XP Pro installed on them (I tend to cheat at times). I have three of the four networked together (the Linux machine is sitting on the floor in the corner as of this moment). I have the three of them sharing DSL internet connection, but for some reason the computer connected directly to the internet can't connect to the network that the other two share, even though they all three can connect to the internet.....Strange. I'm also an avid NASCAR fan. As long as a MOPAR wins, I'm happy. Let me rephrase that. I'm happy as long as a Chevy DOESN'T win. I've always been a Bill Elliot fan (especially when he was annihilating the competition in his Thunderbird) and have been a HUGE Sterling Marlin fan (especially since he has had the Winston Cup points lead since the second week of the season). I hate to admit it, but I also like Tony Stewart. I even hate to admit it more, but I kind of like Dale Earnhardt, Jr. It's even harder to admit since I couldn't stand his father's driving style. I'm also an amateur racer. I raced part of two seasons in the Hobby Stock class (Bomber, Thunder Car, etc.). I didn't get the car (a '72 Plymouth Satellite with a 400 in it until I scattered pieces down the backstretch of Wakeeney Speedway, and then a 440) ready for the beginning of the first season I raced, but was competitive. I had one 2nd place finish and two 4th's. I then set out a season while I was house shopping. I then ran most of a season until I rolled the car down the backstretch at the same Wakeeney speedway. Maybe someone is trying to tell me something. Now that I think about it, I also took a wheatfield tour off the backstretch at Wakeeney. I came screaming out of turn 1 and went right off the top of the track and out through the wheat field. I've been trying to tell everyone that I was trying to get a "Crop Quest" sponsorship, but no one believes me. I'm guessing that it was about 60 bushel wheat, except for the "race car blight" out through the corner of it. That might explain why dad wants to put a combine header on the front of the car and caster wheels on the roof of the car we build this year. Then again, maybe he's just being a smart-@$$!!! I still play Dungeons and Dragons (3rd Edition) as often as possible. We have a small group here in town that tries to play every other weekend, but our schedules clash pretty frequently. I'm also an avid book reader, especially Robert Jordan's Wheel of Time series. I also like R.A. Salvatore's Dark Elf books and Terry Brooks' Shannara series. I also enjoy shooting pool and playing darts. I listen to a lot of music and have over 1,800 MP3's on my computer to listen to. I finally got my dream job. I am now an employee of S&T here in Dighton. I work out of the Dighton branch where I help Jason answer help desk calls, fix computers in the back room (am I the only one who thinks that spyware is as bad as viruses? ), and try to update the S&T website. I've only been there a month, but I enjoy it thoroughly. Neeter and I also just bought a house. I'll be putting up pictures of that in the near future.